This casserole is a cross between Sicilian Supper, one of my favorites, and my Mexican Pizza, which is the first recipe I ever developed. 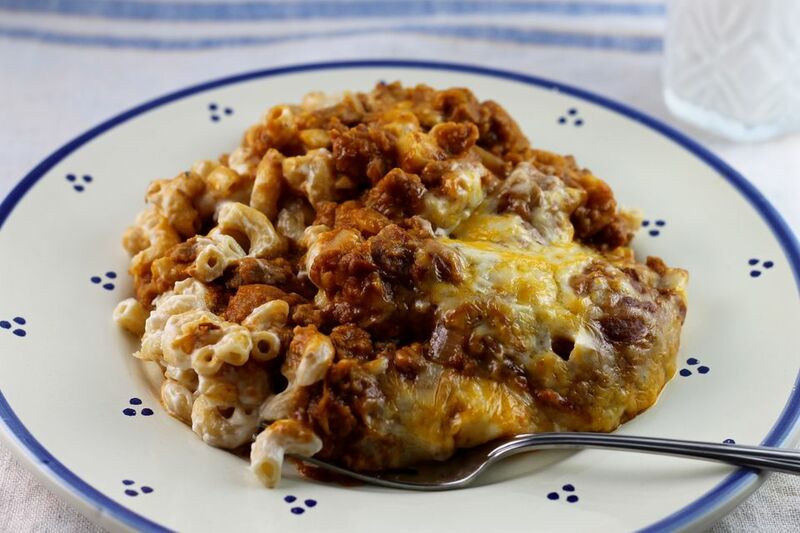 A spicy mixture of frozen crumbles, onion, garlic, refried beans, and taco sauce is layered over a combination of a creamy sauce and elbow macaroni. It's comforting, delicious, and perfect for a weeknight dinner. This recipe makes two casseroles that each serve four people. You can bake them both at once and then refrigerate one to reheat in the microwave later in the week, or you can freeze one. Or if you're freezing a crowd, this is an inexpensive way to do it! You could use ground beef in place of the frozen crumbles if you'd like. Just cook the beef with the onions and garlic, stirring to break up the meat, until browned. Drain well and continue with the recipe. And you can make it as mild or spicy as you'd like. If you like spicy foods, add some chopped green chiles or jalapeño peppers, drained, and add some crushed red pepper flakes or cayenne pepper. This is a "Minnesota spicy" recipe, just for reference. Serve this hearty and comforting dish with a cool and crisp green salad, some steamed or roasted carrots, or corn mixed with some salsa and cream. For dessert, some fresh fruit sprinkled with crumbled macaroon cookies would be easy and refreshing. Bring a large pot of salted water to a boil. Preheat oven to 350°F. Add the crumbles and break up with a fork. Add refried beans, taco sauce, chili powder, cumin, salt, and pepper and bring to a simmer. Lower heat to low and simmer while the pasta cooks, stirring frequently. Add the macaroni to the pot of boiling water and cook according to package directions. Meanwhile, combine cream cheese and milk in large microwave-safe bowl. Microwave on high for 1-2 minutes; remove and stir with a wire whisk until smooth and creamy. Add Alfredo sauce, sour cream, and Parmesan cheese and stir well. When noodles are done, drain and add to the cream cheese mixture in the bowl. Spray 2 2-1/2-quart casserole dishes with nonstick cooking spray. Put half of the noodle mixture into each casserole. Top with the refried bean mixture. Sprinkle with the cheese. Bake for 25-35 minutes or until the casserole are bubbly and the cheese melts and starts to brown.